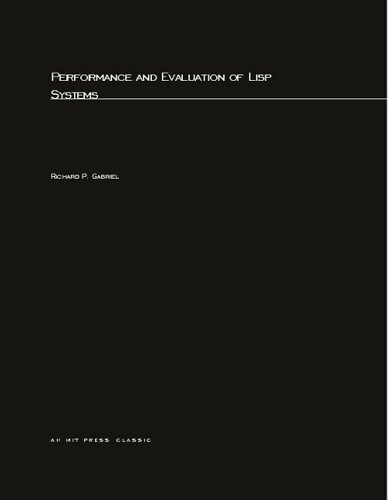 Performance and Evaluation of Lisp Systems is the first book to present descriptions on the Lisp implementation techniques actually in use and can serve as a handbook to the implementation details of all of the various current Lisp expressions. It provides detailed performance information using the tools of benchmarking (the process of utilizing standardized computer programs to test the processing power of different computer systems) to measure the various Lisp systems, and provides an understanding of the technical tradeoffs made during the implementation of a Lisp system. This is a gentle introduction to Common Lisp for students taking their first programming course. No prior mathematical background beyond arithmetic is assumed. There are lots of examples, the author avoided technical jargon. The LISP language is designed primarily for symbolic data processing used for symbolic calculations in differential and integral calculus, electrical circuit theory, mathematical logic, etc. The manual describes LISP, a formal mathematical language. Anyone who has ever learned to program in Lisp will tell you it is very different from any other programming language. It is different in lots of surprising ways- This comic book will let you find out how Lisp's unique design makes it so powerful! This book is concerned with the field of artificial intelligence, the skill of computer programming and the programming language Common Lisp. Careful readers can expect to come away with an appreciation of the major questions and techniques of AI.